Australia waited for this moment for quite some time. Earlier this month, Samantha Stosur surprised the tennis world by beating 13-time major winner Serena Williams to capture the U.S. Open  the first Grand Slam title by an Australian woman since Evonne Goolagong Cawley won Wimbledon in 1980. 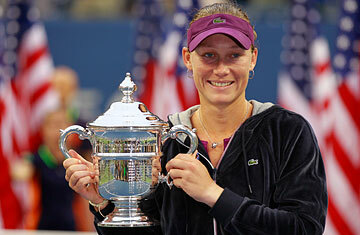 TIME spoke with Stosur about her big win, her struggle with Lyme disease and her plans for the future. It was such an exciting two weeks for me in New York City. I celebrated with a bunch of Australian friends at a little bar eating pizza. It was a small group but very enjoyable. Which tennis players inspired you when you were growing up? My favorite two players were Monica Seles and Steffi Graf. I went to watch them play in the final of the Australian Open. They were both great champions. I also admired Patrick Rafter, being a fellow Queenslander. Did you always want to play professional tennis? I did always dream of being a professional player. I think every kid does dream of being a pro, but to last the journey you have to love tennis as a sport and if you are lucky enough to make it in the pros, it is really a bonus. How difficult was it for you at the beginning of your career? I think all tennis players have to struggle through the early stages of their career. We start off playing tournaments and really just get by. I always had a dream to play in the big tournaments and never have doubted if it was worth it. Having to battle a little early on in my career makes it all the more worthwhile now. During the 2007 and '08 seasons, you were sidelined for months with Lyme disease. How much did it affect you physically? I always believed I would play again, but it made me learn exactly what I wanted to get out of the sport. It was terribly debilitating when I was sick, and for a long time nobody really knew what was wrong with me, which was incredibly frustrating. You were one of the favorites heading into the French Open this year but fell short. Was it hard to bounce back from that? It was a tough loss in Roland Garros this year, as well as at Wimbledon. I was working hard all through the year and not getting the results I desired. Tennis has so many good players, and if we are not on top of our game we can lose. I was very determined to have a good final Grand Slam of the year and extremely happy to once again perform on the big stage. What would it mean to win a Grand Slam in front of the home crowd? I would love to win the Australian Open, no doubt about it. It has been such a long time since an Australian won at home. I will work hard in the off-season to give myself the best chance possible. So many things have to go right to win a Slam, but I know I will give myself the best chance I can. Who is your fiercest rival on the court? There are so many great champions on the women's tour. I always enjoy playing Serena and have never beaten Maria Sharapova. Last year I got to play Justine Henin a couple of times, and they were great matches. How do you relax off the court? Once your tennis career winds down, what would you like to do? I think I will always stay involved in tennis and would like to give back by helping out young players. I have done a little commentary and may one day enjoy doing that again. I really love competing and plan on staying on the tour for quite a few more years. Read about how the U.S. Open fined Serena Williams $2,000. See photos from the 2011 U.S. Open.